This volume embodies the high standards and bold thinking that Powers strives for. The art once again puts its genius to the fore with bold colours, strong layout choices and graphic depictions to shock and awe. Any work that is courageous enough to have 14 consecutive pages of art without a single word on the page demands your respect. It is these bold statements that make Powers a leader in the genre. As well as standard graphic novel storytelling the writer uses other mimicked formats such as the magazine article, humorous advertisement, tabloid interview and even a plain court transcript with no visuals whatsoever. It is very reminiscent of Alan Moore’s work and care must be taken not to come across as trying too hard. The dialogue is still top notch and it is nice to see Deena and Walker and their relationship plus their respective pasts given the screen time they deserve. This work contains three stories, the first is called Groupies. Superheroes are now such an ingrained part of our culture it is easy to apply real-world themes to them and see what happens. Groupies concerns a particular type of woman who seeks out Superheroes just as we have those who seek out rock stars or footballers. It is a great ‘what if’ premise and superbly executed with much attention paid to the media and celebrity culture in which we live now. This is writing of the highest quality as it encourages us to look at our own lives and the world around us rather than just escape from it. The next is Ride Along, a term describing a writer accompanying a professional (usually the police) in order to better understand what they do. In this case a comic book writer accompanies Walker and gets into a dangerous situation. There is some witty banter and a lengthy diatribe about the prevalence of superhero comics. The unusual thing is that the writer in question is named as Warren Ellis. Is Bendis name-dropping? Is Ellis hijacking this work in order to soapbox or is it just a cynical marketing ploy. It is over before you can form a definite opinion but hopefully this isn’t the start of a worrying trend. 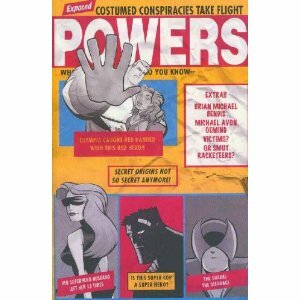 The third is The Shark, a neat little whodunit that is the Powers bread and butter. It is a textbook piece of plotting and twist that doesn’t have the additional sparkle of other Powers storylines. It also switches from graphic novel to mocked-up court transcript half way through and so loses the amazing artwork that is integral to Powers success. As a bonus there is an activity/ colouring book which parodies the safety publications given to the schoolchildren of yesteryear. Another example of Powers trying new things and fearlessly taking new directions. Overall this is an excellent work and I am proud to give it another Thumbs Up! This entry was posted in Graphic Novel and tagged Brian Michael Bendis, Thumbs Up! by 365gn. Bookmark the permalink.